Gen Xtinct: Funky Food Friday: Peeeeople! To paraphrase Charlton Heston (or Phil Hartman doing Charlton Heston): Peeeeople! Today’s Funky Food Friday is about peeeeeople! We’re the appetizer, main course and dessert, at least from the perspective of the shark from “Jaws,” which is our topic du jour. 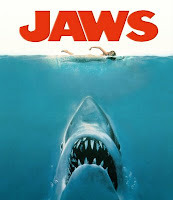 June 20 was this phenomenal fishy flick’s 35th anniversary, and to celebrate, Encore is running an all-day marathon featuring the original and the three stinky sequels. • The thrumming suspense – we don’t even see the shark until the last part of the movie. • The John Williams score. • The iconic characters – chiefly Chief Brody and Quint. OK, I guess when the credits rolled. That’s one. If you haven’t seen the original for a while, sit down this weekend with a plate of sushi and watch Spielberg work his magic. It won’t take you long to remember why you wouldn’t even go into a swimming pool until you made sure there was nothing but water inside.